Your family will have plenty of space to roam under this angled base playset featuring a five foot deck. Your cubs will enjoy hours of outdoor play on the Lion’s Den – swinging from the swings, scaling the rock wall, sliding down the slippery slide and climbing up and down the rope ladder. During the hot summer days, stay cool in the shade while riding on the 360° tire swing. Plus, Lion’s Den is complete with powder-coated steel safety handles and a unique ladder with handles built in – making it easy for kids to get on the deck. Dacromet coated hardtware to prevent rust. 5 Year Warranty Subject to proper installation and normal residential use, Woodplay warrants, subject to the limitations stated below, to the original retail purchaser all chain, seats, swing hangers, hardware, metal braces, ropes and accessories to be free from defects in material and workmanship for a period of five years from date of purchase. Cracks in non-functional plastic components are not considered defects in materials and workmanship if they do not affect the functionality of the playset. Merchandise covered under this limited five-year warranty will, at our option, be repaired or replaced, excluding any freight or labor fees. 15 Year Warranty In addition, for fifteen years after the original purchase date of our cedar playsets, Woodplay warrants, to the original retail purchaser, all wooden components against structural failure due to corrosion, wood rot, or insect infestation. Seasonal checks, surface cracks, knotholes and knots, not resulting in structural failure are natural characteristics of all wooden play equipment, and are not covered under this warranty and will not affect the integrity of your playset. Limited Lifetime Warranty Further, for the lifetime of our redwood playsets, Woodplay warrants, to the original retail purchaser all wooden components against structural failure due to corrosion, wood rot, or insect infestation. Seasonal checks, surface cracks, knotholes and knots not resulting in structural failure, are natural characteristics of all wooden play equipment, and are not covered under this warranty and will not affect the integrity of your playset. Woodplay warrants to the original retail customer that we will replace any swing hangers, swing chains, metal braces, metal rungs or hardware that fail due to rust or breakage (excludes surface rust). This limited lifetime warranty also applies to our exclusive Super Slide, Hurricane Slide and Alpine Slide. Timber is a natural material which can absorb and release moisture. Although this product is designed to minimize this effect, in certain circumstances some movement or distortion is unavoidable. During dry hot weather timber may shrink and check - this is a normal process of weathering. After the first year of service it is advisable to clean and apply a non-toxic stain or sealant to the wood, safe for children’s use. Components covered under this 5 year, 15 year and limited lifetime warranty will be replaced free of charge excluding freight and labor fees. Non-residential use of the playset is prohibited and voids the warranty as the playsets are designed for residential use only. Escalade Sports reserves the right to examine photographs and/or physical evidence of merchandise claimed to be defective, and to recover said merchandise prior to disposition of warranty claims. Merchandise returned to our factory for examination or recovery must be shipped freight prepaid unless a return authorization number is issued. This warranty program does not cover normal wear and tear, color fading, or damages resulting from misuse, abuse, vandalism, alteration, acts of God, or assembly and maintenance contrary to our instructions. Escalade Sports assumes no responsibility for incidental or consequential damages which may arise from the purchase or use of our equipment. Please supervise your children’s play activity and maintain your play equipment periodically. This warranty is expressly in lieu of all other warranties, expressed or implied, including warranties of merchantability or fitness for use. Woodplay does not assume or authorize any person to assume for us, any other liability in connection with the sale of our products. Special Note: Woodplay reserves the right to make changes in materials, design, and pricing without notice. See your instruction manual for maintenance requirements. Your child’s safety is your responsibility; therefore you should inspect this equipment regularly for wear and safety. 5 Year Warranty Subject to proper installation and normal residential use, Woodplay warrants, subject to the limitations stated below, to the original retail purchaser all chain, seats, swing hangers, hardware, metal braces, ropes and accessories to be free from defects in material and workmanship for a period of five years from date of purchase. Cracks in non-functional plastic components are not considered defects in materials and workmanship if they do not affect the functionality of the playset. Merchandise covered under this limited five-year warranty will, at our option, be repaired or replaced, excluding any freight or labor fees. 15 Year Warranty In addition, for fifteen years after the original purchase date of our cedar playsets, Woodplay warrants, to the original retail purchaser, all wooden components against structural failure due to corrosion, wood rot, or insect infestation. Seasonal checks, surface cracks, knotholes and knots, not resulting in structural failure are natural characteristics of all wooden play equipment, and are not covered under this warranty and will not affect the integrity of your playset. 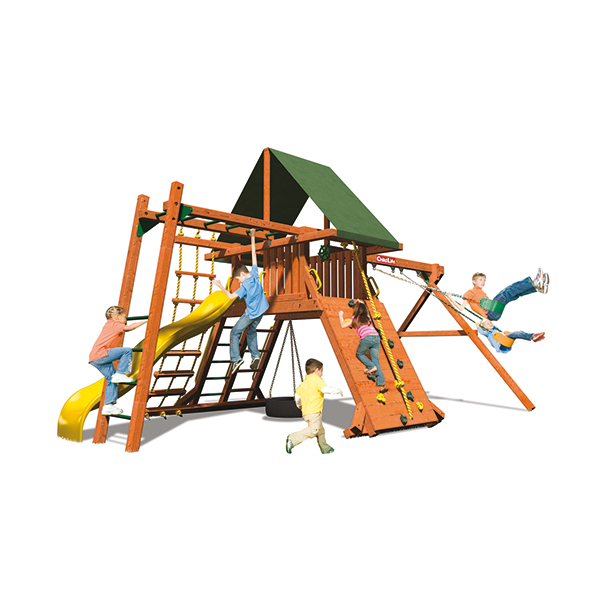 Limited Lifetime Warranty Further, for the lifetime of our redwood playsets, Woodplay warrants, to the original retail purchaser all wooden components against structural failure due to corrosion, wood rot, or insect infestation. Seasonal checks, surface cracks, knotholes and knots not resulting in structural failure, are natural characteristics of all wooden play equipment, and are not covered under this warranty and will not affect the integrity of your playset. Woodplay warrants to the original retail customer that we will replace any swing hangers, swing chains, metal braces, metal rungs or hardware that fail due to rust or breakage (excludes surface rust). This limited lifetime warranty also applies to our exclusive Super Slide, Hurricane Slide and Alpine Slide. Timber is a natural material which can absorb and release moisture. Although this product is designed to minimize this effect, in certain circumstances some movement or distortion is unavoidable. During dry hot weather timber may shrink and check - this is a normal process of weathering. After the first year of service it is advisable to clean and apply a non-toxic stain or sealant to the wood, safe for children’s use. Components covered under this 5 year, 15 year and limited lifetime warranty will be replaced free of charge excluding freight and labor fees. Non-residential use of the playset is prohibited and voids the warranty as the playsets are designed for residential use only. Escalade Sports reserves the right to examine photographs and/or physical evidence of merchandise claimed to be defective, and to recover said merchandise prior to disposition of warranty claims. Merchandise returned to our factory for examination or recovery must be shipped freight prepaid unless a return authorization number is issued. This warranty program does not cover normal wear and tear, color fading, or damages resulting from misuse, abuse, vandalism, alteration, acts of God, or assembly and maintenance contrary to our instructions. Escalade Sports assumes no responsibility for incidental or consequential damages which may arise from the purchase or use of our equipment. Please supervise your children’s play activity and maintain your play equipment periodically. This warranty is expressly in lieu of all other warranties, expressed or implied, including warranties of merchantability or fitness for use. Woodplay does not assume or authorize any person to assume for us, any other liability in connection with the sale of our products. Special Note: Woodplay reserves the right to make changes in materials, design, and pricing without notice. See your instruction manual for maintenance requirements. Your child’s safety is your responsibility; therefore you should inspect this equipment regularly for wear and safety.